After a Georgian court ruled that protesting subway workers can strike only outside working hours, activists are condemning what they call an unlawful decision that sets a dangerous precedent for workers' rights in the country. “Paralysis of the Tbilisi Metro, the cheapest and fastest means of transportation, used daily by about 400,000 passengers,” would cause the “collapse of road infrastructure,” putting Tbilisi’s residents at risk by delaying public health and fire services, Judge Giorgi Gogichashvili argued. Union representatives say the decision contravenes the very definition of a strike, which is a refusal to work in order to force concessions from employers. Ghvinianidze says the moratorium could last anywhere between “a few months to several years” due to the large backlog of cases in Tbilisi City Court. Rati Kapanadze, head of Unity 2013, told Eurasianet that the union will go ahead with the strikes as planned, but have yet to agree on when they will begin. “We will defend our right to strike and will weigh our options. We have obeyed the law and now they are making a mockery of workers and undermining our most basic rights,” he said. A ruling on May 3 had banned the union from striking this month. Unity 2013 complied by delaying its planned strikes until June. Drivers stated their intention to strike in April after their employer, the Tbilisi Transport Company, refused to raise their wages. Drivers said an average driver made 1,150 lari ($465) a month, and that their hourly pay was 7 lari (about $3), which they demanded should be raised to 10 lari ($4). Kapanadze says that 60 percent of Tbilisi’s metro workers die before they can claim their pensions. Dangerous working conditions underground, which often cause eye problems and lung conditions, result in drivers spending up to 50 percent of their salaries on medical expenses, he said. On April 30 the transport company, which is owned by Tbilisi City Hall, said it cannot “raise the salaries of particular groups” since this would cause discontent among other workers. The company also operates the capital’s bus network. “There are 6,300 people employed in our company and improving their working conditions is one of our priorities,” they stated April 30. But advocates for the metro drivers said that was an unreasonable standard to demand and accused Tbilisi Transport Company of trying to pit its workers against one another. “It’s not possible for Unity 2013 to represent other workers’ interests because their bargaining unit is a drivers’ union – these are the people it is legally responsible for,” Japaridze, the workers’ rights activist, argued. 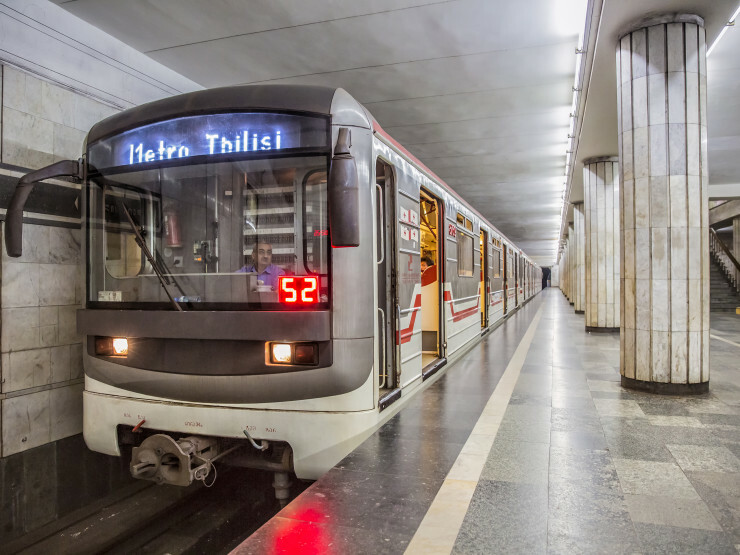 Tbilisi Mayor Kakha Kaladze said he would do everything to keep the metro operating.